Next: Skid Shot Toilet Paper Blaster - Fires Spitballs Up To 30 Feet! 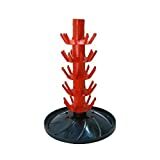 I try to hold back putting up all the cool new Christmas Stuff until at least after Halloween, but with this cool new Wine Bottle Christmas Tree I think that you'll need the extra time to trim it properly. 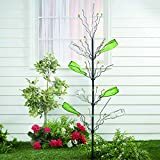 This extra festive Christmas tree forgoes the typical tree itself and uses a lot of empty wine bottles to stand in for the branches. 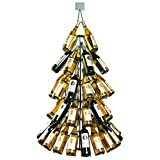 To decorate, just drink up to 83 bottles of your favorite vino (come on you can do it - get your friends in on the fun), and then, one by one, slide each bottle down onto a metal prong / tree tip until it's lush and full. It's even pre-lit with 500 clear lights to illuminate your bottles with exta holiday cheer. Best of all, after Christmas, there's no need to throw away an entire living tree that was cut down to be a very temporary decoration, just recycle your bottles and plan to stock up again for next year. Available in 7 or 4 foot versions.